This generously sized, hardcover book is a treasure trove of over 1,000 interesting, wacky facts. From skate-boarding dogs, the world’s strangest fish (you just have to see the Goblin Shark!) and even Crystal Caves there are 200 full color themed spreads. As is the norm with National Geographic, the photos are visually stunning and the accompanying facts are fascinating for children and even adults too. This book would be a great holiday gift idea for children of all ages. My own children love this book….my six year old is able to read much of the text aloud and my young ones like to look at the pictures. It is affordably priced on sale at only $15.96 (SRP $19.99) and is available for purchase online at the National Geographic Store. Check out the “Weird but True” app which is available at iTunes for only $1.99 too! 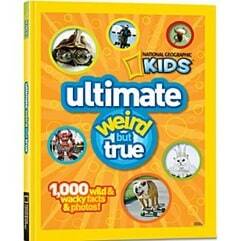 One lucky reader will receive a copy of Ultimate Weird but True by National Geographic Kids AND a $10 iTunes gift card! I would love to give the Baltic Amber Heart Locket as a gift! I like the Men’s Microsuede Travel Vest! I would love to give the Wacky Wigglers Mechanical Toy Set to my daughter. They have tons of offerings… I like the Kids Book about the 50 states. Thanks for the giveaway…we like the “Carabiner Clip Watch with LED Micro-light”. I would love the Sterling Silver Roman Glass Bracelet! The Roman Cast-brass Horse looks very nice!